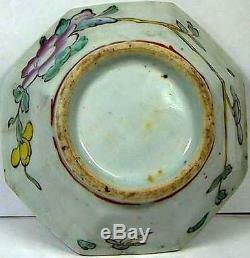 Very Nicely Preserved, Very Beautiful, Genuine 19th Century Chinese Ming Dynasty Style Famille Rose Porcelain Bowl. Perfect as a Candy or Potpourri Bowl for Work or Home. CLASSIFICATION : Famille Rose Style Porcelain Bowl. ATTRIBUTION : Ancient China, Qing Dynasty, Between 1800 and 1850 A. Diameter: 127 millimeters (5 1/8 inches) at top rim; 63 millimeters (2 1/2 inches) at base. Height: 46 millimeters (1 7/8 inches). Notes: Potpourri or decorative wrapped hard candy available upon request. A little wear consistent with any household item which is between four and five centuries in age. A few very faint, very small hairline cracks (lines) in the porcelain glaze. The typical blemishes of hand production (warts and dimples, zits and pits). Not flawless, but certainly in an excellent state of preservation. DETAIL : A splendidly preserved octagon-shaped famille rose porcelain bowl so wonderfully characteristic of the very popular export Ming and Qing Dynasty porcelain china. The particular style was extremely popular both in England and Europe throughout the 16th to 19th centuries, as well as in the USA during the 1800s. This piece is a wonderful example of this very famous produce. The glaze is entirely intact, vibrantly colored, and the condition of the plate is wonderful! As you can see, the bowl not only has a delightful hand-painted floral design on the outside surface of the bowl, the inside sports a gorgeous and thick green porcelain glaze. If you look closely at the pictures here, you will see that there are a few very fine, very short hairline cracks in the porcelain glaze extending from the rim toward the bottom of the bowl for perhaps one-quarter to one-half of an inch. They are very fine, short cracks, very easy to overlook and not easy to spot, even when you are looking for them and know where they are. These fine hairline glaze cracks are so common in ancient porcelain that by many in the trade they are called age lines. Of course the porcelain glaze lines are as much indications of the age of the piece as they are a detriment. There are of course a few minor scuffs, marks, dings, etc. This includes two of the virtually obligatory very tiny rim chips very difficult to detect, and of course, entirely normal for a bowl several centuries old. This is as good as one can reasonably expect of a household artifact which was originally produced in the late eighteen or early nineteenth century. Its not perfect, but it is about as close to perfect as you will ordinarily find of an authentic antique porcelain plate like this, and there are no repairs. Of course realistically one would expect some blemishes of a porcelain plate produced several hundred years ago (you and I should look so good several centuries after being "born"), so there are no surprises here except that there are so few blemishes. The glazing is entirely intact, the colors remain quite vibrant. There are a few production blemishes, quite typical of hand-crafted porcelain of the late Ming/early Qing Dynasties, an assortment of warts, dimples, pits, and zits. Overall it is an exceptionally attractive piece, and extraordinarily well preserved specimen of the ancient Chinese art of pottery. If youd like an authentic antique, colorful Ming Style bowl from the 19th century to proudly display, you could not go wrong with this one. It is solidly shaped, nicely featured, and nicely proportioned. It would make a unique candy or change dish. You could display this one with great pride either at work on your desk or at home. Either way, it will certainly generate curiosity and perhaps even a little envy! We can even include wrapped decorative candy and/or potpourri upon request so the piece is ready for display or gift giving right out of the box! Was the last imperial dynasty of China. Imperial patronage stimulated one of China's most intense periods of ceramic production, characterized by unmatched technical expertise and refinement in blue and white, monochrome, and polychrome ceramics. Colorful enamel porcelain overglazes were invented. The process of enameling was further developed, along with a nearly endless number of new shades for monochrome-glazed porcelain. An innovative new technique produced five-colored porcelains. Applying a variety of under-glaze pigments to decorative schemes of flower, landscape and figurative scenes, these five-colored porcelains gained great renown in Western Europe. In almost every major European museum, you will find either five-colored or monochromatic porcelain (in blue, red, yellow or pink) from this period. The finest export wares were produced for European markets in the 17th and 18th centuries. The famille wares (such as this) which had been introduced during the Ming Dynasty gained great popularity in Europe. Perhaps the most exciting pottery was produced in small, provincial workshops. The potters here did not compete with the elaborate imperial kilns, but instead created delightful wares for local patrons. Small porcelain items such as teapots, pen rests, and water droppers were commonly found on most any gentleman's desk from China to Europe. The Manchus retained many institutions of Ming and earlier Chinese Dynasties, continuing Confucian court practices and temple rituals. The Manchu emperors supported Chinese literary and historical projects of enormous scope. The survival of much of China's ancient literature is attributed to these projects. However the Manchu were suspicious of Han Chinese, so the Qing Dynasty rulers took steps to ensure that the Manchus were not simply absorbed into the larger, dominant Han Chinese population. Han Chinese were prohibited from migrating into the Manchu homeland, and Manchus were forbidden to engage in trade or manual labor. Intermarriage between the two groups was forbidden. In many government positions a system of dual appointments was used--the Chinese appointee was required to do the substantive work and the Manchu to ensure Han loyalty to the Qing Dynasty. The Qing regime was determined to protect itself not only from internal rebellion but also from foreign invasion. After all of China had been subjugated, the Manchus conquered Outer Mongolia, gained control of much of Central Asia and Tibet. The Qing became the first dynasty to eliminate successfully all danger to China from across its land borders. The power of the Chinese Empire reached the highest point in its 2000-year history, and then collapsed. The collapse was partly due to internal decay, but as well due to external pressures exerted by the Western European powers. Ironically the fatal threat to the Qing Dynasty did not come overland as in the past, but by sea in the form of traders, missionaries, and soldiers of fortune from Europe. The mindset that China was in every respect superior to outside barbarians resulted in an inability to evaluate correctly or respond flexibly to the new challenges presented by technologically and militarily superior Western European countries. Ultimately this cultural rigidity resulted in the demise of the Qing and the collapse of the entire millennia-old framework of dynastic rule. China was literally dismembered by Western European countries who fought over the carcass like so many wild animals. Shortly after the Sino-Japanese War the Western-educated Sun Yat-sen had initiated a revolutionary movement which established a republican form of government, overthrowing the last imperial dynasty. Of course the Republic of China was in turn overthrown by the Communists after the conclusion of World War II. HISTORY OF CHINESE EARTHENWARE : The first Chinese ceramics archaeologists have found date back more than 10,000 years. These were earthenware, which means they were made from clay and fired at the kind of low temperatures reached by a wood fire or simple oven. In China, most ceramics made before the Tang dynasty 600 A. They may be glazed or unglazed, and are occasionally painted, often brightly colored. Stoneware ceramics are harder and less porous than earthenware and are fired at hotter temperaturesbetween 2100°F and 2400°F. At these high temperatures, the surface of the clay melts and becomes glassy. Although stoneware is usually waterproof, most stoneware ceramics are glazed for decoration. The glazes often contain ash, which allows the glaze to harden at stoneware temperatures. Bronze metallurgy superceded ceramics as the favored art form of the ruling class. However both the ceramic and the bronze industries evolved into complex systems of production that were supported by the aristocracy. Decorative designs rich in symbolism were created first in bronze were then imitated in clay. Although archaeological finds have revealed that glazed pottery was produced as early as 1100 B. During the Zhou dynasty, the production of glazed wares was not common until about 200 B. However from about 1000 B.
Onwards during the Shang and Zhou dynasties, primitive porcelain wares emerged. Real porcelain wares appeared in the Han dynasty around 200 A. In the process of porcelain development, different styles in different periods blossomed. The production of porcelain became widespread by about 500 A. Using a special clay with ground rock containing feldspar, a glassy mineral, the material was fired at very high temperatures above 2400°F. The surface of the clay melts at such high temperatures and becomes smooth as glass. Early porcelains were undecorated and were used by the Imperial court and exported as far as the Middle East. 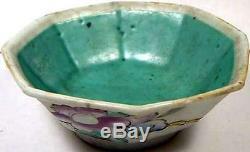 For instance during the Han Dynasty principally celadon (green) and black porcelain were mainly produced. The famous blue and white porcelain was created with blue paint made from cobalt and then covered with a clear glaze, which can withstand the high temperatures of the kiln. The technical and creative innovations of Chinese potters are unique accomplishments in the cultural heritage of the world. Today, archaeological excavation and research in China are revealing new sites and new examples of the genius of the Chinese potter. HISTORY OF CHINESE CIVILIZATION : Remains of Homo erectus , found near Beijing, have been dated back 460,000 years. Recent archaeological studies in the Yangtse River area have provided evidence of ancient cultures (and rice cultivation) flourishing more than 11,500 years ago, contrary to the conventional belief that the Yellow River area was the cradle of the Chinese civilization. The Neolithic period flourished with a multiplicity of cultures in different regions dating back to around 5000 B. Written records go back more than 3,500 years, and the written history is (as is the case with Ancient Egypt) divided into dynasties, families of kings or emperors. The voluminous records kept by the ancient Chinese provide us with knowledge into their strong sense of their real and mythological origins as well as of their neighbors. The Chinese knew how to cultivate and weave silk and were trading the luxurious fabric with other nations by about 1000 B. The production and value of silk tell much about the advanced state of early Chinese civilization. Cultivation of silkworms required mulberry tree orchards, temperature controls and periodic feedings around the clock. More than 2,000 silkworms were required to produce one pound of silk. The Chinese also mastered spinning, dyeing and weaving silk threads into fabric. Bodies were buried with food containers and other possessions, presumably to assist the smooth passage of the dead to the next world. The relative success of ancient China can be attributed to the superiority of their ideographic written language, their technology, and their political institutions; the refinement of their artistic and intellectual creativity; and the sheer weight of their numbers. A recurrent historical theme has been the unceasing struggle of the sedentary Chinese against the threats posed by non-Chinese peoples on the margins of their territory in the north, northeast, and northwest. China saw itself surrounded on all sides by so-called barbarian peoples whose cultures were demonstrably inferior by Chinese standards. This China-centered ("sinocentric") view of the world was still undisturbed in the nineteenth century, at the time of the first serious confrontation with the West. Of course the ancient Chinese showed a remarkable ability to absorb the people of surrounding areas into their own civilization. The process of assimilation continued over the centuries through conquest and colonization until what is now known as China Proper was brought under unified rule. We package as well as anyone in the business, with lots of protective padding and containers. Unfortunately the contents of parcels are easily lost or misdelivered by postal employees even in the USA. Please ask for a rate quotation. Most of the items I offer come from the collection of a family friend who was active in the field of Archaeology for over forty years. Though I have always had an interest in archaeology, my own academic background was in sociology and cultural anthropology. After my retirement however, I found myself drawn to archaeology as well. I spend over half of my year out of the United States, and have spent much of my life either in India or Eastern Europe. Petersburg, as well as some other worthy institutions in Europe connected with Anthropology and Archaeology. I acquire some small but interesting collections overseas from time-to-time, and have as well some duplicate items within my own collection which I occasionally decide to part with. Though I have a collection of ancient coins numbering in the tens of thousands, my primary interest is in ancient jewelry. My wife also is an active participant in the business of antique and ancient jewelry, and is from Russia. The item "Antique 1800AD Hand Painted Ming Style Famille Rose Porcelain Octagonal Bowl" is in sale since Monday, November 20, 2017. This item is in the category "Antiques\Decorative Arts\Ceramics & Porcelain\Bowls". The seller is "ancientgifts" and is located in Lummi Island, Washington. This item can be shipped worldwide.